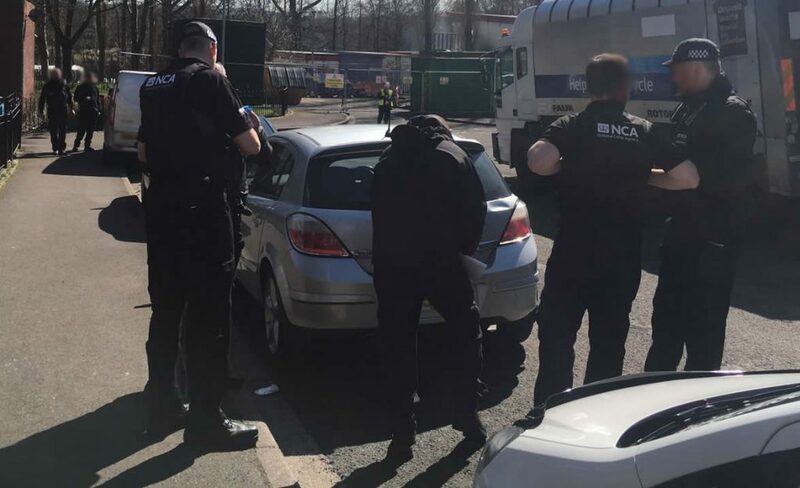 An international law enforcement operation has disrupted what is believed to be one of the most significant people smuggling networks operating between Iraq and the UK. National Crime Agency (NCA) officers arrested three suspected members of the group yesterday in the North West of England and Staffordshire. The 41-year-old man believed to be the head of the network was arrested at his home in Oldham, where officers seized £15,500 in cash. A 38-year-old man was arrested in Stoke on Trent and a 35-year-old man was arrested in the Newton Heath area of Manchester. At the Newton Heath property another man, 25, was arrested by Immigration Enforcement on suspicion of illegally entering the UK. NCA officers are questioning the suspected head of the criminal network this morning, while the two other men have been released on conditional 28-day-bail. These arrests, for suspected immigration offences, coincided with the arrests of two men in the Ghent area of Belgium following several months of joint operational work between the NCA and Belgian Federal Police. In the Belgian action a 15-year-old boy was rescued before he boarded a lorry bound for the UK. The operation followed arrests made last month in Germany and Romania, coordinated by Europol and Eurojust. The suspects, all from or with links to the Kurdish community, are believed to be part of a network of smugglers, couriers and complicit lorry drivers stretching from Iraq to the UK. The NCA believes the network are behind the smuggling of almost three thousand migrants into Europe in a three month period last year. Many were trying to reach the UK. 75kgs of hand-rolling tobacco and more than 500,000 cigarettes were discovered during searches. David Norris, NCA branch commander, said: “Between the Middle East and the UK lies a network of highly organised criminal groups who smuggle desperate people in dangerous conditions for huge sums of money. “We believe during this operation we have identified and now disrupted one of the most significant of these groups, and the impact of acting in tandem with our European partners on this operation has meant we have been able to cause permanent damage to a well-established network. This is the second major NCA strike this year against people smugglers operating in the UK. In February, the agency’s officers disrupted a suspected network operating from the North East of England in one of the agency’s biggest-ever deployments. NCA officers arrested 21 subjects in that operation, all of whom were released under investigation. The NCA leads Project Invigor, a multi-agency campaign to tackle organised immigration crime. The Project Invigor taskforce includes officers from Immigration Enforcement, Border Force, and the Crown Prosecution Service. It works with international partners to target suspected criminal networks behind people smuggling in the Mediterranean and at the UK border.